IT • Pazzi viaggi d’avventura! Fun international groups enjoying the Mountain Freedom Feeling together at unique, remote locations. Join and be part of it! Break away from your daily routines and your daily social environment. Cut the cables! Imagine yourself in a remote place in overwhelmingly beautiful nature. Loose control & find yourself. Enjoy being who you really are. Share this unique and intense experience with a very diverse group, people of all ages and nationalities. 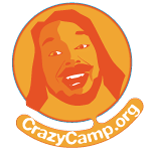 Welcome to the world of CrazyCamp.org! Fill in the form below and you will receive a message every now and then about new Crazy Camps. In every newsletter there will be a link that you can use to unsubscribe.